Have you got any documentation or other information about this adapter? Tell me! In case you find yourself in the increasingly common circumstance of having a computer without a floppy disk drive, or without a low density 3.5" diskette, here's a zipped version of the option diskette's contents. The RAM chips on mine are all Fujitsu MB81256-12. (Yes, this is both the ZIPs in row A and the DIPs in rows B and C...) Memory in bank A is soldered in place. Orchid was bought out by Micronics. (Micronics made at least one planar/motherboard for IBM to use in a PC Server.) Micronics was bought out by Diamond Multimedia. Diamond did not return my request for information on this adapter. Of course, Diamond has been through a number of different organizations and companies as well. It's likely that anyone working there now has no memory of these older products. Whatever records existed about these products have probably been tossed as well. Globe, Incorporated of New Jersey made the savage purple tabs. They are P/N A1012 and A1006. I thought that Globe had gone out of business (or maybe just didn't have a web site?) but I was wrong! 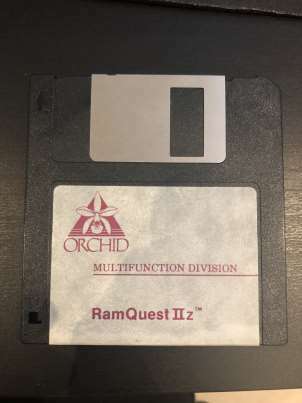 All files are dated June 24th, 1988 with a time stamp of midnight, except for RQIIZ_10 with its date being September 25th, 1988 at 9:54 AM. Consisting entirely of stuff from Google Books and their scans of InfoWorld magazine. "Calculated Genius" advertisement from Orchid, appearing in the November 29th, 1988 issue of InfoWorld magazine. "RamQuest 50/60" advertisement in the May 25th, 1987 issue of InfoWorld magazine. Pricing for the RamQuest IIz from a reseller advertisement, featured in InfoWorld magazine's February 26th, 1990 issue. Here's an announcement of the RamQuest IIz's planned release from the November 7th, 1988 issue of InfoWorld magazine. Mention is also made of Intel's PCEO and their competing Above Board memory expansion product for PS/2 computers with the Microchannel bus. Any more information on this adapter would be very much appreciated! Tell me if you know more! Copyright © 2006-2018 by William R. Walsh. Some Rights Reserved. This page may be reproduced freely in its original form with all copyright noticies present and unaltered as long as no charge is assessed for providing this information, other than reasonable charges for duplicating, media cost, or connection/access time. Last updated: 12/23/2018, previously updated 8/10/2017.